Kauṇḍinya (Sanskrit; Pali: Koṇḍañña) also known as Ājñātakauṇḍinya, Pali: Añña Koṇḍañña) was a Buddhist monk follower of Gautama Buddha and the first to become an arhat. He lived during the 6th century BCE in what is now Uttar Pradesh and Bihar, India. Kaundinya was a brahmin who first came to prominence as a youth due to his mastery of the Vedas and was later appointed as a royal court scholar of King Suddhodana of the Sakyas in Kapilavastu. 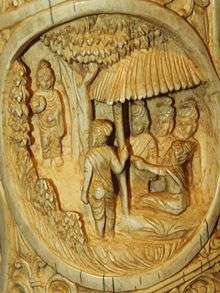 There Koṇḍañña was the only scholar who unequivocally predicted upon the birth of Prince Siddhartha that the prince would become an enlightened Buddha, and vowed to become his disciple. Koṇḍañña and four colleagues followed Siddhartha in six years of ascetic practice, but abandoned him in disgust after Siddhartha gave up the practice of self-mortification. 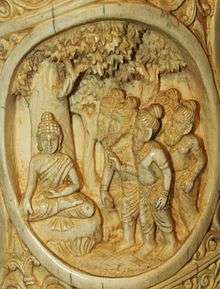 Upon enlightenment, Siddartha gave his first dharma talk to Koṇḍañña's group. Koṇḍañña was the first to comprehend the teaching and thus became the first bhikkhu and arahat. 1 2 3 4 5 6 7 8 9 10 11 12 Malasekera, G. P. (1961). Encyclopaedia of Buddhism. Government of Ceylon. pp. 696–698. ↑ Narada (1992). A Manual of Buddhism. Buddha Educational Foundation. p. 12. ISBN 967-9920-58-5. ↑ Narada (1992). A Manual of Buddhism. Buddha Educational Foundation. pp. 20–25. ISBN 967-9920-58-5. ↑ Thanissaro Bhikkhu (1993). 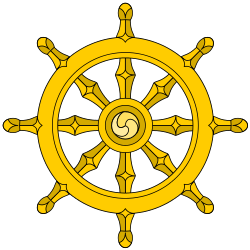 "Dhammacakkappavattana Sutta: Setting the Wheel of Dhamma in Motion (SN 56.11)". Retrieved 2007-07-17. ↑ Malasekera, G. P. "Punna". Buddhist Dictionary of Pali Proper Names. Pali Text Society. Retrieved 2007-07-18. ↑ "Soka Gakkai Dictionary of Buddhism: Ajnata Kaundinya". Soka Gakkai International USA. Retrieved 2006-11-28.